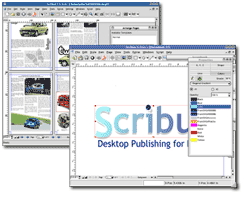 Scribus is an open-source program that brings award-winning professional page layout to Linux/UNIX, Mac OS X, OS/2 and Windows desktops with a combination of “press-ready” output and new approaches to page layout. Underneath the modern and user friendly interface, Scribus supports professional publishing features, such as CMYK color, separations, Spot Colors, ICC color management and versatile PDF creation. After almost 2 years of intensive work, the Scribus Team is proud to announce the release of Scribus 1.3.5. This release is a major development version on the road to milestone 1.4, which will be based on 1.3.5. Deb package for jaunty can be found at Getdeb. Mandriva 2009 RPM*: http://download.opensuse.org/repositories/home:/mrdocs/Mandriva_2009/ .A package for 2009.1 is not yet available because of a dependency issue.